Ryan Christie celebrates his 21st birthday today. He will do so still delighting over making it to the 23-minute mark. The £500,000 signing was introduced in the 67th minute of Celtic’s 3-0 win over former team Inverness Caledonian Thistle. 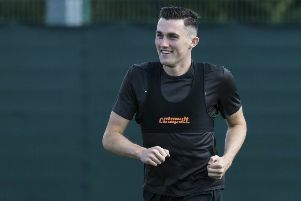 That provided the midfielder with 23 minutes – of normal time, anyway – to demonstrate why he might be worth game time in an area of the side where Celtic are chock-a-block with choices. The opportunity was seized. Until the weekend, Christie had earned only 11 minutes of game time in two outings in Celtic colours. He has only sported this livery since he was restored to fitness in early January following his recall from the loan spell with his Highland hometown team that started the moment he was bought by the Scottish champions last September. The player accepted he “was just in the door and back from injury and so finding my feet”, but equally did not see any of these factors as impediments to being ready to push for a first-team place in the short term. In tandem with what he readily stated were fellow “flair” substitutions Scott Allan and Patrick Roberts – given a 20-minute debut following his loan move from Manchester City – Christie’s entertaining enterprise improved the mood around Parkhead. That was gloomy after an entirely unconvincing first hour – even subsequent to the two goals in a seven-minute period that clinched the encounter for Celtic just before Christie appeared. Steven and Johansen were withdrawn. “In training you see the link-up play. It’s hard because you guys don’t really see the training much but there is a real togetherness. Especially in the attacking third, even with the likes of Tom [Rogic] it’s all very technically gifted players. If you put us all together on a pitch, we’ll start playing very well.